"I've experimented with these a lot and have finally found a combination that comes out as stiff as gelatin desserts but are completely vegan. Works well as a substitute for gelatin in other recipes or just as treats on it's own. Half of a cup of chilled juice can be replaced with your favorite liquor to make a cocktail." Dissolve the cornstarch in the water in a small cup or bowl and set aside. In a saucepan, combine 1 1/2 cups of cherry juice and agar-agar powder. Let stand for 5 minutes to soften. Set heat to medium-high and bring to a simmer. Simmer for 1 minute. Remove from the heat and stir in the remaining juice along with the cornstarch mixture until no longer cloudy. Pour into small serving cups and refrigerate for 4 hours before serving. Make Easy Vegan "Nice Cream"
This recipe works great! The texture isn't quite like gelatin, but the kids don't know the difference. Mine set up within about 1 1/2 hours. Do you have to use cherry juice?? Or can you use other juices? Tried this and it was a complete failure. 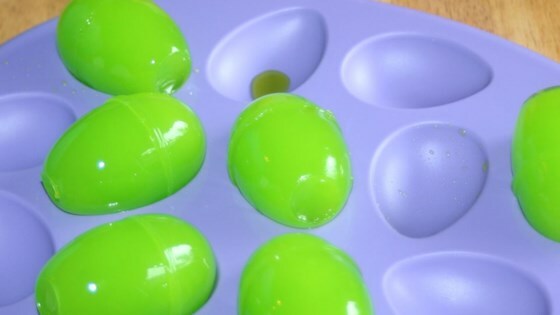 I was trying to make molded jelly eggs. I wish I had noticed the comment that, if using agar flakes, you measure in tablespoons. I might try it again. It was good! I made it for my vegetarian friend and they loved it!